Disclaimer: We were provided with a Quirkbot robot kit for the purposes of this review. As always our opinions are our own. 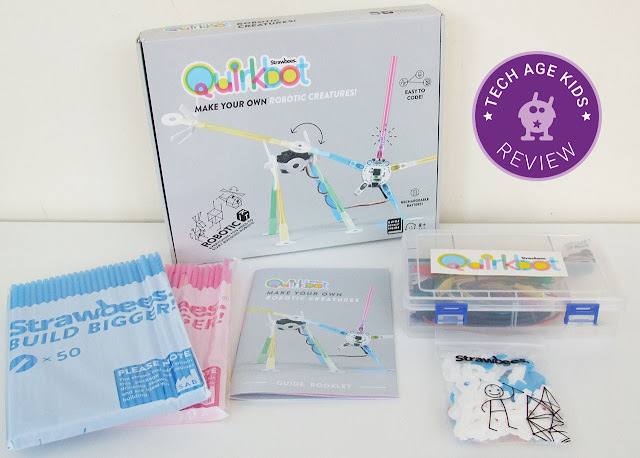 The Quirkbot Robot Kit for the largest selection of robotic toys comes in a cardboard box containing straws and Strawbees and a plastic storage box containing all of the electronics components and accessories. The plastic storage box is really useful as the kit has some really small components and you'll want to keep everything up together. 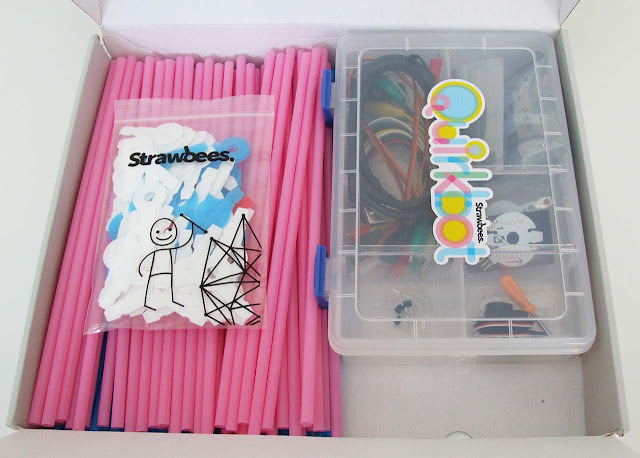 What are Quirkbot and Strawbees? There's quite a lot going on in this kit. First there are the straws and Strawbees. We've used Strawbees before. They are plastic connectors that allow you to make structures using drinking straws. See our geodesic dome made using Strawbees with straws and glowsticks. Quirkbot is a beginner microprocessor board which is designed to work with Strawbees. It has a small built-in rechargeable battery which is very useful. 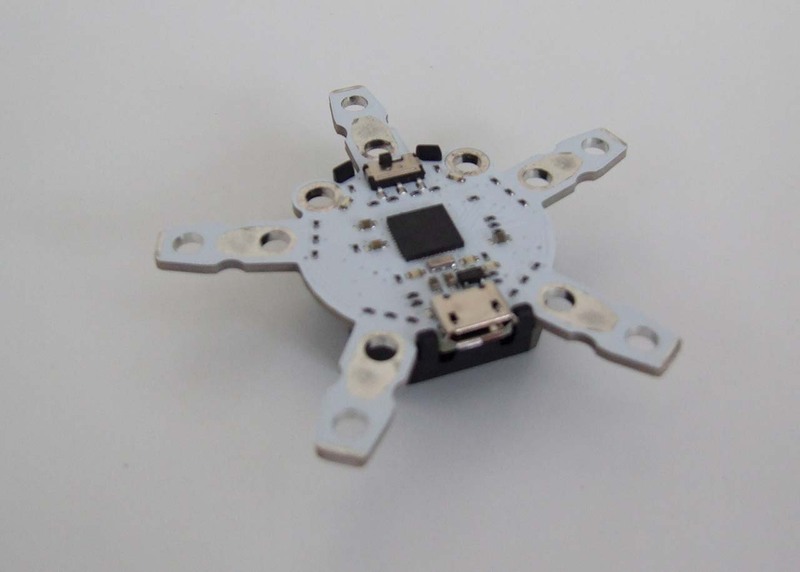 Quirkbot has five legs that can be used to connect components or get touch input. You can also attach servos via an add-on backpack. You program the Quirkbot via a web-based graphical editor so you can make robots and interactive models with custom behaviour. I tried out Quirkbot with my eight year old (the kit is recommended for age 8+.) He has spent lots of time with Strawbees and has used the Tech Will Save Us Mover Kit, BBC micro:bit, SAM Labs and lots of other electronics kits. The Quirkbot needs charging via USB so you might want to put it on to charge first. If you haven't used Strawbees before trying this kit we'd recommend spending some time with them first to get used to how they fit together. There are some tricks to working with the connectors. You can read about them in the documentation or spend some time playing first and see what you can discover. We'd recommend creating a really simple project first such as lighting up an LED when you touch one of the legs of the Quirkbot. Then you can quickly see how everything works. The graphical editor uses a flow-based wiring approach to connecting inputs and outputs. It's a similar approach to Flotilla Rockpool. Children might take a bit of time to get used to the way it works if they're more familiar with procedural style block editors. Some things are easy to do using the Quirkbot approach, such as controlling an LED based on a wave pattern, others are much harder such as setting a servo to different positions depending on which input is triggered. Being able to switch to Arduino textual code mode is really neat. We love that the Quirkbot editor can upload code to the device at the push of a button. In general the editor worked pretty smoothly. You can use it with or without an account which means you can get started quickly and then save your projects once you're up and running. We found it annoying to have to click 'X' after selecting an option from drop-down lists. The Quirkbot has 4 controllable LEDs on board: left and right eyes and left and right mouth. Note that the words left and right are used as seen from above but the images show the Quirkbot from underneath where the LEDs actually are! This is very confusing. My 8 year old still can't tell his left from his right (he can blame my genes for that) so this didn't bother him at all. When connected to a computer via USB the Quirkbot can send key presses which means that you can use the Quirkbot to control Scratch, Minecraft and other programs that use keyboard input. The servo introduces movement into projects. You can screw an attachment onto the servo which can go inside a straw with a Strawbee so the servo can move a structure made from straws. We couldn't get the Strawbee plus servo inside a straw so we trapped the servo arm between two Strawbees instead. A couple of loom bands can secure the join for projects that need it. The LEDs are red/blue and can programmed to light up in either colour. You use straws to hold them in place on the legs. You also get three light sensors. You can create a 'squeeze sensor' by placing a light sensor at one end of a straw and an LED powered by the included Strawbee coin cell battery holder at the other end. 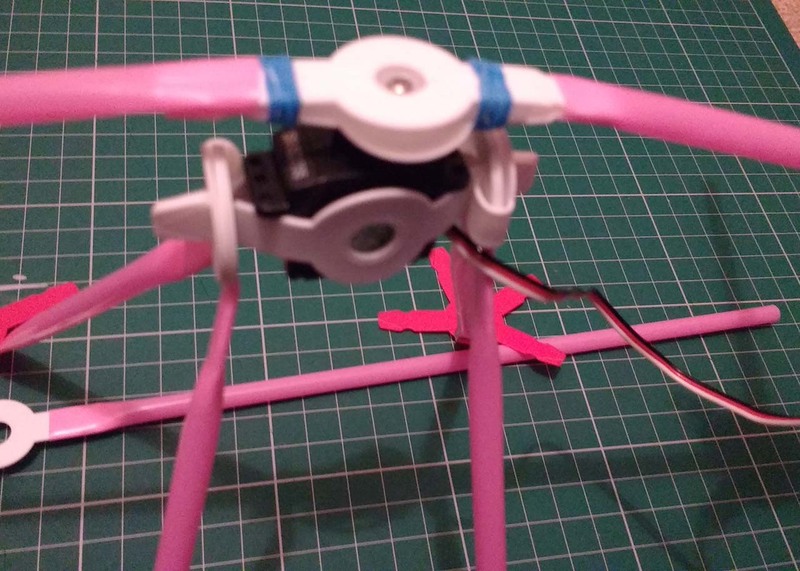 You can attach your own electronics components to the legs and there are extension pins on the back of the Quirkbot which can be used to add on 'backpacks' such as the servo backpack or to connect additional components. 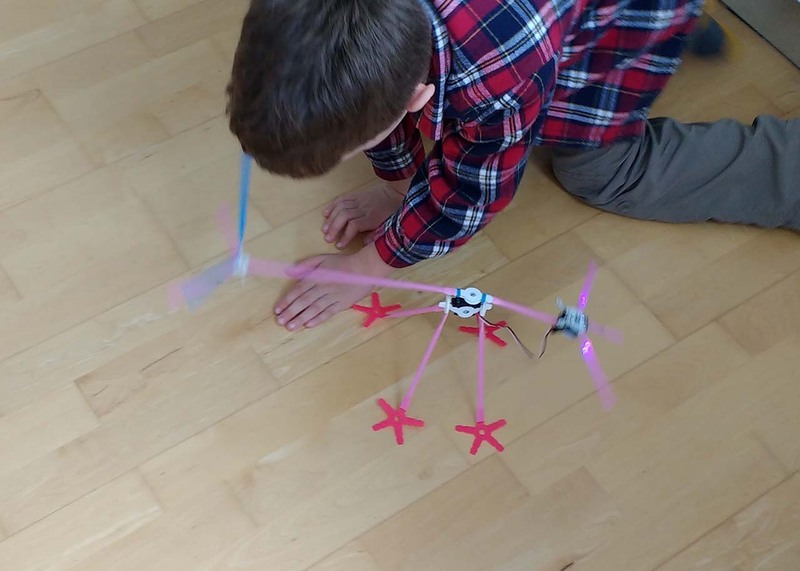 We looked on the Quirkbot website and my son chose a balancing game. He found the instructions quite hard to follow, the photos didn't seem to quite match the diagrams and there was no way he could get a straw over a Strawbee plus a servo arm as seems to be required. I couldn't either. The guidebook suggests stretching the straw with a pencil but the mismatch was too big for this so we had to find a workaround we used loom bands to secure the servo arm. The code for project is provided but there's no explanation so we had to play around to see how it worked. We found that we had to adjust the values to work well with our servo and structure. We also had to adjust the Strawbees quite a bit to get the ball to roll without falling off. Next we tried out controlling lights with a squeeze sensor. You place an LED at one end of a straw using the coin cell battery holder and put a light sensor at the other end. My son used the squeeze sensor to control LEDs. He needed help to get things set up. Next we tried the StriderBot - a creature that moves using motion from the servo. Again the instructions weren't very clear and multiple versions of the project were pictured. This is fine for later projects but we wanted something simple to see how stuff worked. We couldn't get the legs to work as shown. They just splayed out. We added another Strawbee and locked it in place to hold the legs steady. This helped a lot. We managed to get the StriderBot dancing which made my son happy. He adapted his original design and also wanted to add LEDs to this project and experimented with setting them to purple by mixing red and blue. 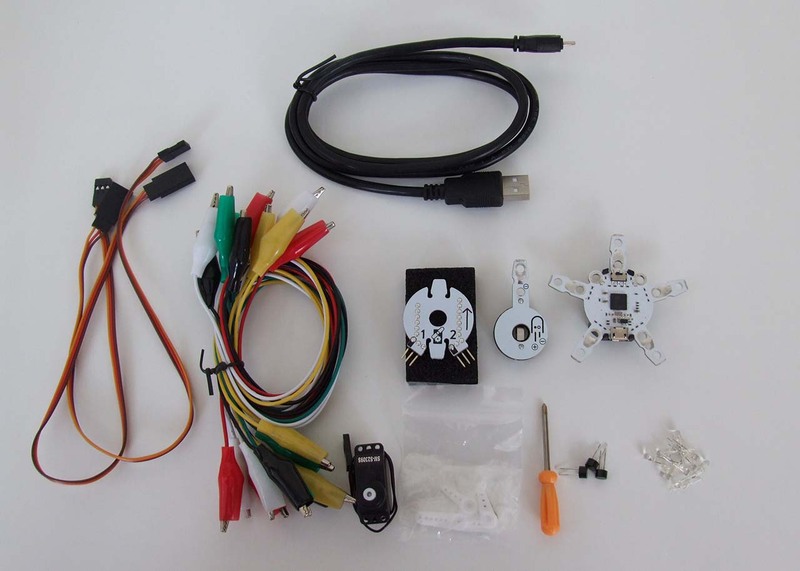 The Quirkbot is a really neat device for STEAM projects. We love that it has a rechargeable battery, so many devices require an external battery that you have to work out how to include in your project. External batteries are often heavy too which constrains what you can make. 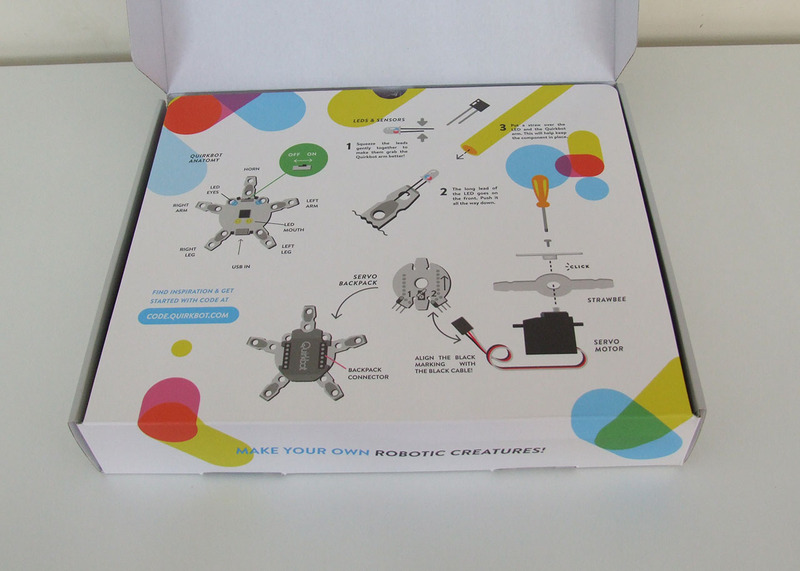 The documentation for the Quirkbot leaves you to work out a lot for yourself. This is fine for families, teachers and kids with some experience or strong motivation, but beginners might feel a bit out of their depth for a while. The example projects make a lot of use of the Wave function. This is a neat trick but it really doesn't help kids to learn to basics of controlling the outputs. We'd like to see some simpler projects that introduce concepts gradually. Some simple starter projects with easy to follow instructions would be useful. But in the longer term having projects that require lots of engineering is a great way to develop kids skills. The USB input capability is great, controlling Minecraft or Scratch from electronics is always good fun for kids. My 8 year old hates following instructions and loves making crazy contraptions so Quirkbot is a really good fit for him.